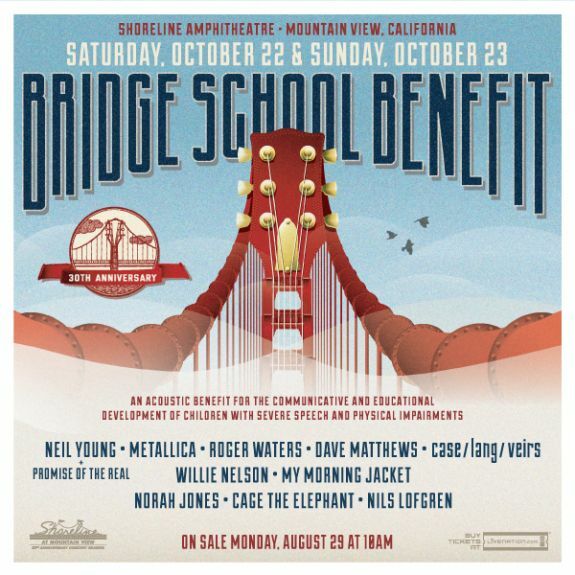 Willie Nelson & Family fans can download sound board quality recordings of live shows, including Willie Nelson & Family’s sets at Neil Young’s Bridge School Benefit concerts in October. Visit Willie Nelson’s website to down-load mp3 files of Willie Nelson & Family Concert. Here’s your chance to listen to sound-board recordings of Willie’s concerts. They have a long list of concerts available now; lots of great listening. Willie Nelson’s fan club is selling recordings of Willie Nelson’s Fourth of July Picnic at the BackYard last Sunday. 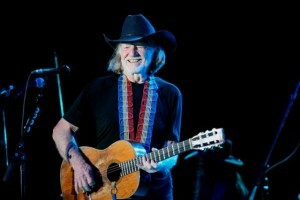 Willie Nelson brought it all back home for his annual 4th of July Picnic at The Backyard in Bee Cave, Texas last Sunday. It was an all-day, star-studded event that was broadcast live on Willie’s Place, but Willie himself didn’t take the stage until after midnight on July 5!! For those that weren’t able to catch his set, Willie’s Place is airing two encore presentations of Willie Nelson & Family recorded live at the 4th of July Picnic. This two-hour special will feature short sets from his daughter Paula Nelson & The Guilty Pleasures (with her sister Amy) and son Micah and his band The Reflectacles (with Kris Kristofferson, Mickey Raphael and Gail Swanson), followed by a historic picnic performance from Willie himself, accompanied by Ray Benson from Asleep at the Wheel with guest spots from David Allan Coe and the Blackwood Brothers Quartet. 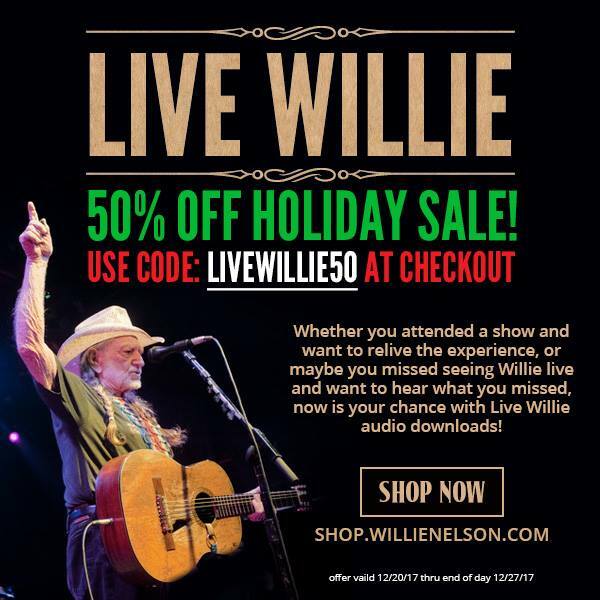 You can also purchase a digital download of the audio concert from livewillie.com. 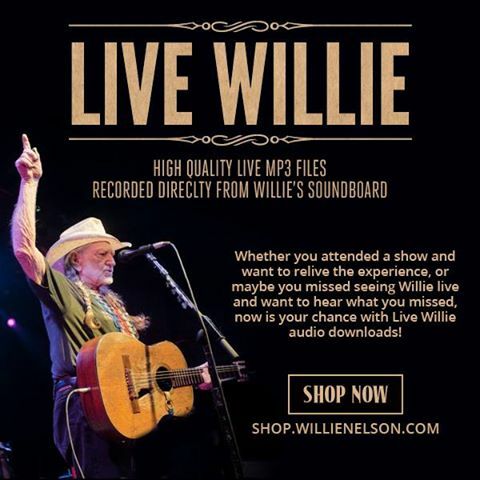 It is the live recording of Willie Nelson’s live set for $12.99 – all 29 songs. All downloads are compatible with Windows and Mac and once downloaded, played on iPod/iPhones, can be burned to disc, or played through your computer or any mp3 player. 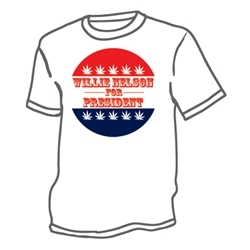 I don’t know if you have been over to www.LiveWillie.com lately, but you should go. They have a growing collection of Willie Nelson and Family Shows available for purchase on USB wristbands/memory sticks. The wristbands plug right into any USB port on your computer, and you can listen to it on your computer (as many times as you want) burn it to a CD, or upload it to your iPod or any mp3 compatible device. Get Upcoming Willie Nelson Live Shows onÂ the USB Wristband! 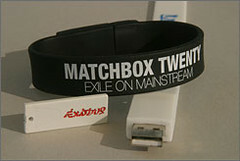 The showsÂ will beÂ recorded live and loaded toÂ a 256mb USB wristband that plugs into any USB port.Â Listen toÂ the showÂ on your computer, share it with friends, burn it to a CD, or upload it to your iPod or mp3 compatible device! This unique music experience has been featured on the Today Show, USA Today and Billboard Magazine! Get your wristbands now for shows coming up this January, more coming soon! Get 10% off when you pre-order now! Pick your wristband up at the show! If you can’t make it, you still receive yourÂ discount andÂ we’ll ship your wristband free of charge! You won’t miss a thing! If you didn’t see as many Willie Nelson & Family shows as you wanted to last yearÂ (and who did? 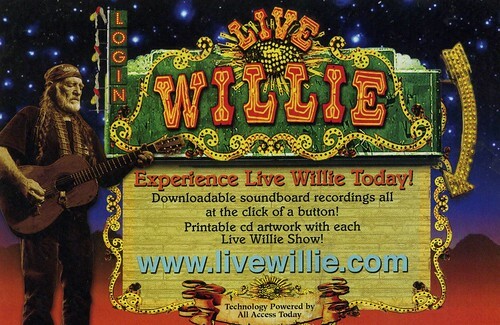 ), lucky us, we can hear live, sound-board quality recordings of many of his concerts, from 2000 to the present.Â LiveWillie! records the shows, and sells them on USB memory sticks/bracelets.Â Â You plug them into the usb drive on your computer, and download them to your hard drive, and listen as often as you want. 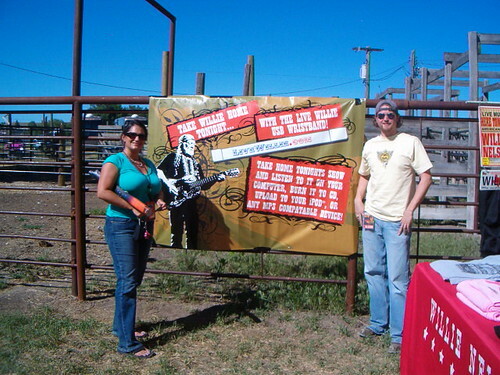 Rachel, and Chris, of www.LiveWillie.com at the Choteau, Montana show (7/3/07).Â At the site, you can purchase live recordings of Willie Nelson and Family shows, on USB wristbands. All Access has some cool Willie Nelson souvenirs for sale, including the above packageÂ theyÂ shipped with tickets to Willie Nelson’s picnic. 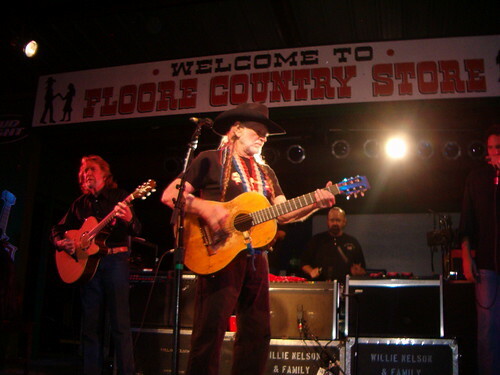 Willie Nelson and Family Concert at Floore’s Country Store Available at Live!Willie! This was such a fantastic show, and it is so great that everyone can get a recording of it, soundboard quality, of this show, and so fast!Â Â Thanks to Rachel, Chris and Crew for making this happen. The wristbands plug right into any USB port on your computer, and you canÂ listen to it on your computer, burn it to a CD, or upload it to your iPod or any mp3 compatible device! This is an audio recording and does not include visual content. 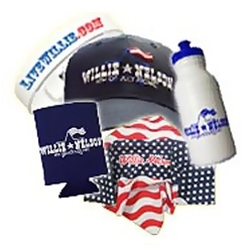 Â Click Here to get your USB wristband and many other great Willie Nelson offers! If youâ€™ve got the money, honey.